Below is the current list of dodgy installers, if you find inaccurate information, updates or additions to our list, please post in the discussion portion of this topic and a Moderator or Admin will verify and update the list. Cyberlink BD Advisor - Google Toolbar. Game House Installers - Google Desktop Search and/or Google Toolbar for IE. 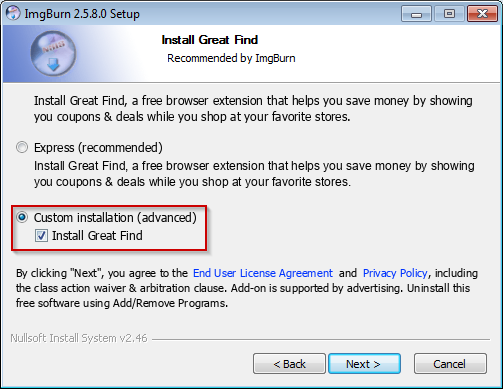 Norton products - Ask Search in Norton toolbar. No option to remove and it was pushed by including in a Norton patch. OpenCandy - offering third party software. Report says that even if you do not install the 3rd party software, there is modification in the registry, files and will add tracking cookies. There's also Conduit Toolbar in the page. Quick Media Converter HD - Ask Toolbar, Ask Search, Ask Homepage (by default). Risingware Fast Start Genie - installs Fast Start Genie and Risingware i-Desktop. Spyware Terminator - Web security guard, Crawler. Windows Live Installer - Windows Live Toolbar and Sign-in Assistant. Awesome we have the list! Now let's report new or changes to the programs above and we will get them updated and or added! Ccleaner now has a pre-checked offer to install Google Chrome as your default browser, in their Standard install. Offers "slim" build with no pre-checked offers. Admin/Teacher at Malware Removal University You too could train to help others. Thanks I have updated it! If I may, there's more to Adobe products. If you download them from Internet Explorer, you'll be offered Google Chrome and Google Toolbar for Internet Explorer. If you download them from Google Chrome, Mozilla Firefox or another web browser, you'll be offered the classic McAfee Security Scan Plus. Also, Java doesn't bundle the Ask! Toolbar anymore, but asks to set Yahoo! as your homepage and default search engine on Internet Explorer. These are the two obvious corrections I can see. Oh and ImgBurn doesn't bundle Ask! Toolbar nor Uniblue Desktop Icons anymore. It have OpenCandy built-in the installer, and also offers Ad-Aware Web Companion, as well as setting up Bing as the homepage, new tab and default search engine on Internet Explorer and Mozilla Firefox. Unchecking Ad-Aware Web Companion will also uncheck Bing. Unchecking Bing however, leaves Ad-Aware checked. 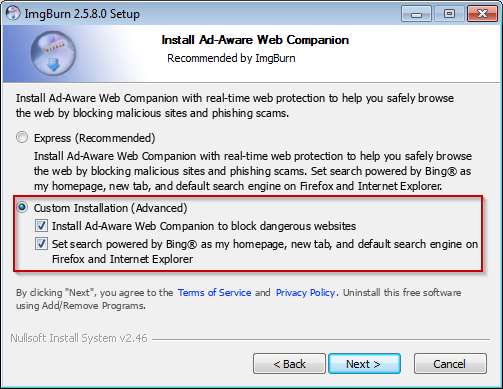 It also bundles Great Find which is most likely plain Adware. I can check other programs later if you wish. To verify, I used FF when checking these 2 products. I used FF checking Java and nothing was offered. I have Adblock Plus enabled in FF, if that makes any difference. 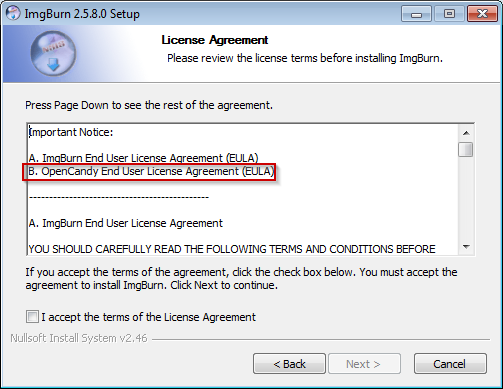 Java I found that it's only offers PUA's or PUP's when the program self updates but if you download and install it doesn't offer anything most times. 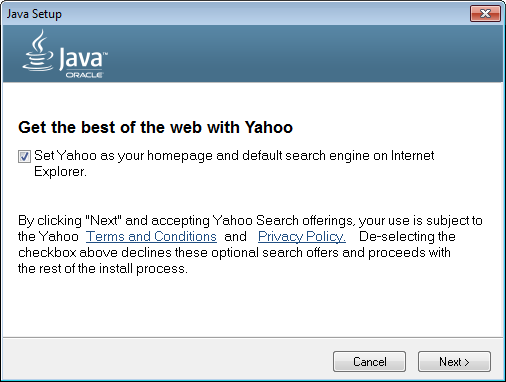 I downloaded Java from Mozilla Firefox and it offered me Yahoo!. Where did you download it from? I downloaded it straight from Java.com. No offers of any 3rd party software. Defraggler now has pre-checked offer to Install Google Chrome as my default browser. That's weird. I'll try to see if I can reproduce that on a VM tonight using the three web browsers: Internet Explorer, Mozilla Firefox and Google Chrome. Also this confirms a partnership between Yahoo! and Oracle. I updated the list for Oracle Java... and Yahoo. The reason I do not see anything offered is because I had previously checked the "Suppress sponsor offers when installing or updating." box in the Java Control panel... see updated list.